The game currently has two 10-point filler units, one that feels like she's only worth 10 points and another one that wins games. That actually makes the niche fairly crowded already, but I'm game to try something new. The only way to evaluate a 10-point filler unit is by comparing it against other 10-point filler units, though it is definitely worth considering that Bol synergizes with the Nottingham Brigands. Move, Range, Attack, and Defense all match Otonashi. Both have a situational attack boost, a form of Disengage, and an occasionally useful other power. Seems to fit in well. Goblins have only been found under evil generals so far, and traditionally goblins are evil creatures. But it's common in fantasy, including D&D, for individuals to go against the mold and stand on their own, so a lone goblin on the side of good isn't particularly strange. That he is a Tricky Rogue with opportunistic abilities plays into that as well, as he still feels goblinish, just less evil than most. The miniature, while tiny and visually fits with the other goblins, stands out with his different skill color. Opportunism is the key ability that makes Bol stand out. It's a clever way to get free order markers on a unit that normally wouldn't get any until he's the only one left. It gives him some real value in the necessary comparison with Isamu; while Bol doesn't have Isamu's potential, it's nice to get a consolation prize for losing order markers. In general I push back against 4-power cards, as it usually suggests overdesign. In Bol's case, Scale is pretty much necessary, and Disengage is pretty common and almost necessary for his type of unit. Ankle Shank is the take-it-or-leave-it power of the set, being situational and not especially powerful. It does give him a little extra kick, both in terms of value and theme, and all of the powers are very easy to remember. So he gets a pass. On his own, Bol doesn't do much, as you'd expect. A single melee attack of 2 isn't worth putting order markers on unless you don't have anything else. He could possibly be used to take a glyph, but he doesn't have the defenses to hold it for long. Ankle Shank isn't potent enough to make Bol a viable threat to make an opponent play around him or overextend to kill him. If you have Unique Heroes you put order markers on it's nice to have Bol around. It's almost always a downgrade of your order marker to have it fall on Li' Yellow, but it's certainly better than losing it entirely. Of course, just running forward is likely to get Bol killed before he does anything, but Opportunism tends to be more useful in the late stages of a game when you may find yourself relying on the little guy anyway. If you're really lucky you'll get a free swing at one of your opponent's big fellows. A Nottingham Brigand army seems like a perfect fit for Bol, but I found it disappointing at best. First, Brigands are not Unique, and that's where the order markers are in a Rogue army. Which means Bol's best attribute, free turns from Opportunism, is not in play. Yes, he can get bonding turns from the Brigands, but not as long as there is at least one other Rogue to bond with as Bol is almost always the worse choice. Not that he's entirely unhelpful here, though: he's still a Rogue and he's still only 10 points. As a 10-point filler, Bol is pretty neat, though rarely worth taking over Isamu. That's fine; I wouldn't want another Isamu in the game, and it would be nice to have another decent option available. In Hero-heavy armies he's a nice addition, and doesn't hurt in most other armies either. I vote Yea to induct Bol into the SoV. See my earlier review, but change the parts where I talk about Uzog having too much value at 85 points and change it to him feeling like a good threat for 110 points. Uzog is still a beast savage, but at his new point cost he feels a lot more natural in his hybrid menacer/cheerleader role, and he compares well with other bonding heroes of that point range. I'm a big fan of this big brute savage. I vote Yea to induct Uzog into the Soldiers of Valhalla. Last edited by BiggaBullfrog; February 14th, 2018 at 07:30 PM. Reason: Valentine's Day has to be the best day to upvote Uzog, right? For too long the Drow have sat by the wayside, without much interest (except the Chainfighter) suffering from poor order marker optimization, and generally lower rankings. I set out to fix this lack of cohesion, and set the Drow up as the odd yet intriguing Dark Elf faction they were meant to be. I present the Drow Assassin for submission. 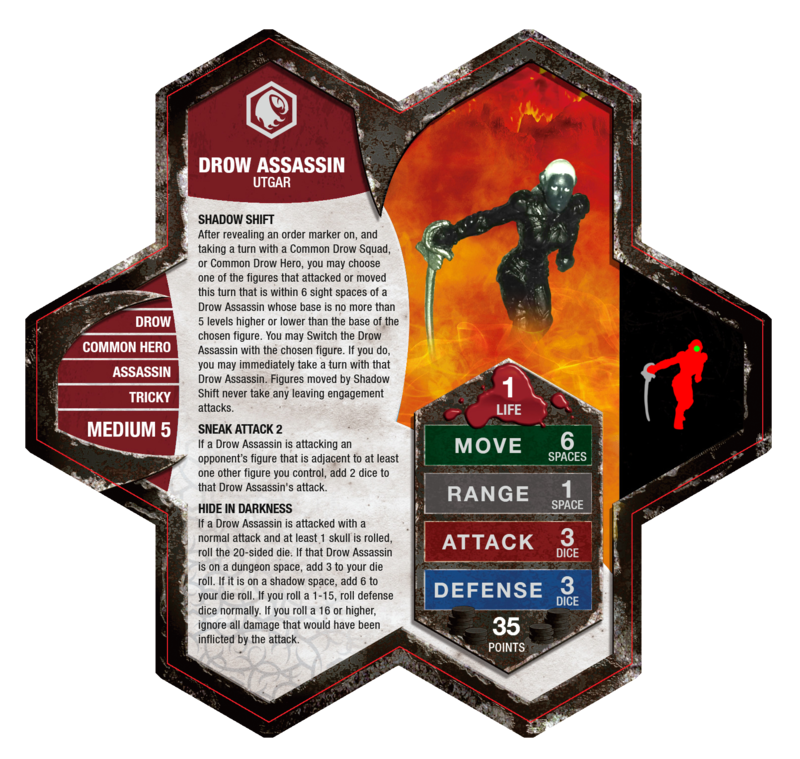 After revealing an order marker on, and taking a turn with a Common Drow Squad, or Common Drow Hero, you may choose one of the figures that attacked or moved this turn that is within 6 sight spaces of a Drow Assassin whose base is no more than 5 levels higher or lower than the base of the chosen figure. You may Switch the Drow Assassin with the chosen figure. If you do, you may immediately take a turn with that Drow Assassin. Figures moved by Shadow Shift never take any leaving engagement attacks. If a Drow Assassin is attacking an opponent's figure that is adjacent to at least one other figure you control, add 2 dice to that Drow Assassin's attack. If a Drow Assassin is attacked with a normal attack and at least 1 skull is rolled, roll the 20-sided die. If that Drow Assassin is on a dungeon space, add 3 to your die roll. If it is on a shadow space, add 6 to your die roll. If you roll a 1-15, roll defense dice normally. If you roll a 16 or higher, ignore all damage that would have been inflicted by the attack. Creativity: I have a bias towards bonding abilities. I enjoy using them in game, but when it comes to designing customs I don't like using normal generic bonding powers. The Drow especially felt like they shouldn't have the Normal bonding you would expect to see from any other faction. To ensure that I didn't need to make a new Squad to replace the Deepwrym as the B&B, I created Shadow Shift. Shadow Shift was an ability I came up with a little over a year ago or so, and I really liked how it felt on the Drow. The wording is heavily borrowed from the Horned Skull Brutes Barge into Battle ability, but with Bonding thrown in. Sneak Attack really helps spell out the Assassin theme that I'm going for with the Drow Assassin, and I think it fits well with the idea of an underground civilization which is what the Drow are in DnD. They play like you would expect an Assassin to, they follow the group, and wait for the right time to jump in and stab their target in the back. I have really liked the way they incentivize a more strategic play style. Accessibility: The figure is called "Lolth's Sting - 53", and another of the same sculpt is called "Lolth's Sting 05 Promo"
Troll and Toad: 1 currently, though they had more a little while ago, and will probably get more again. Miniature Market: at least 40, with 20+ listed for both Sculpts. Cool Stuff Inc.: 15 in stock currently. Amazon: 4 from various sellers. Ebay: over 20 from various sellers. Game Hollow: 9 currently available. Me: I personally have purchased 20 extra figures from an ebay seller that had was selling a lot of them, and I am willing to sell these for $2.50 each to whoever is interested until I run out. EDIT: I now have 96 of this figure. All that together totaling to 100 + 200 + figures available. Balance: Over the course of my design process with this unit, I have had this gal at prices ranging from 25 points all the way up to 100, and She has been both Unique, and Uncommon at various times. I don't have a number for playtests, but she has felt in line with the two figures I feel are closest to her comparatively. Those figures would be the Drow Chainfighter, and the Nottingham Brigand. The Chainfighter is very fun to use, and has some very solid stats for 25 points at 4/4 with 6 move. The Assassin is 3/3 with 6 move, and you have the potential to get 5 attack with the right setup, so their stats are very comparable. Sneak Attack is a bit harder to pull off, and the Assassin doesn't have a ranged ability, so without bonding about 20 - 25 points so far. Of course the Assassin has bonding so the points need to account for that, and thus we reach 35. In a vacuum not as useful or versatile as the Chainfighter, but with Bonding and the right positioning, the Assassin can shine brighter at the right times. The Brigand is a Bonding Comparison. The bonding itself is harder to use with the Assassin as you still need to place your order markers normally, and you have to make sure you move your figures in such a way that you can still activate the Assassin. The stats aren't quite as easy to compare between these 2. The Brigand is a 3/2, but lacks a potential attack boost. It does however have a range of 7, and range with kiting, or a meat shield, can usually win against melee. The Assassin as a single attacking melee hero the Assassin might at first glance seem like it isn't quite as useful, but She has Shadow Shift, which has a lot of utility. Overall I think they carry a similar potential threat level, but in different ways. The Assassin adds a pretty high threat range of 12 to your army, if you're willing to really push her out of position. Don't let this fool you though, She's really not going to play her best used like that, and Sneak Attack plays into that a lot. With her being that far out of position her likelihood of surviving it very low. When she dies after pushing out too far, not only do you loose your bonder, but you don't take any advantage of her Sneak Attack to do so. At the same time, it can be worth it to get an attack off on Realin or whoever is important to your opponent's army, so there are times when you might still want to send your Assassin on a suicide mission. I feel that this plays into the Assassin Feel though, a general probably would consider sending an Assassin off on a Suicide mission to try to take out an Opponents biggest threats. Playability/Fun: With the exception of the Chainfighter, the Drow presence in Heroscape feels nearly nonexistent outside of Dungeon crawls. I am the only person I have ever seen play a full Drow army at a tournament, and most people really don't seem to care for them. Looking at the CUC, the biggest change they made to help them was to add Bonding, and this is what I did, but in a different and more interesting way I think. With the Assassin the Deepwrym feel way more useful, and the Chainfighters are a great way to move your enemies into a good position to Sneak Attack. She's also a great early game glyph grabber, though you'll probably want to switch her out for a Deepwrym pretty quickly due to her usefulness. Shadow shift adds a whole new dynamic to the way you play an army, and it's a lot of fun. The mobility the Assassin has once She is up to the front of the battlefield helps her get to the right position to pull off some sweat back stabs. Thank you for your consideration. I hope you enjoy the Drow Assassin as much as I do. Last edited by Leaf_It; February 28th, 2018 at 04:06 AM. Reason: Updated card image. Found more availability. I don't think the Drow were designed to be a competitive faction, or even a faction at all per se, but rather a dungeon crawl baddie. Still, I wouldn't mind seeing some additions to the faction. I am a bit wary of the reverse-bonding, but I don't see any real problems with it, and I like the strategic possibilities. The availability is really low, though, for a cheap Common. The 20+s at MM is hopeful, and the 20 you have is possibly the saving grace. Still, together that's only enough for 20 Scapers (figure 3 copies each). Ebay sellers aren't reliable numbers, and the rest is scattered bits. I'm ok with it, but I wouldn't be surprised if it gets rejected. After revealing an order marker on, and taking a turn with a Common Drow Squad, or Uncommon Drow Hero, you may choose one of the figures that attacked or moved this turn that is within 6 sight spaces of a Drow Assassin whose base is no more than 5 levels higher or lower than the base of the chosen figure. You may switch the Drow Assassin with the chosen figure. If you do, you may immediately take a turn with that Drow Assassin. Figures moved by Shadow Shift never take any leaving engagement attacks. Comparable to Darrak Ambershard. This is a really cool concept that I'd hate to see wasted . . . If this design is rejected due to availability as a Common, would it still be rejected on that score if it were an Uncommon Hero? Hard to say with certainty. As a Unique Hero, yeah, but even as an Uncommon people will want multiples (especially people like myself that feel the inherent need to collect). After revealing an order marker on, and taking a turn with a Common Drow Squad, or any Drow Hero, you may choose one of the figures that attacked or moved this turn that is within 6 sight spaces of a Drow Assassin whose base is no more than 5 levels higher or lower than the base of the chosen figure. You may switch the Drow Assassin with the chosen figure. If you do, you may immediately take a turn with that Drow Assassin. Figures moved by Shadow Shift never take any leaving engagement attacks. After revealing an order marker on, and taking a turn with a Common Drow Squad, you may choose one of the figures that attacked or moved this turn that is within 6 sight spaces of a Drow Assassin whose base is no more than 5 levels higher or lower than the base of the chosen figure. You may switch the Drow Assassin with the chosen figure. If you do, you may immediately take a turn with that Drow Assassin. Figures moved by Shadow Shift never take any leaving engagement attacks. This isn't a Workshopping thread, but yeah, I could see a Unique Hero version of the design. I suspect that moves away from Leaf It's original intention, though. It's all moot unless this one gets rejected anyway. I figured I would search through figure trading sites, and forums to try and get as many of these as I could to help with availability. I found a guy in Europe that had 26 of the figure, and was willing to ship internationally for relatively cheap. Once those arrive in about 2 weeks or so, I'll have 46 total figures to sell. I'm in contact with someone else in the US that has some, though I don't know how many yet. I'll keep looking around and let you guys know if I find more. I really don't want availability to be the reason this design gets shot down. Bigga informed me of a method of finding out how much Miniature Market has. They had 21 of the "Lolth's Sting - 53", but have sold 4 of those sometime yesterday, and currently have 17. As for the "Lolth's Sting 05 Promo", they have 26. After looking closer at Ebay, there are currently more than 30 that I was able to find, ranging from $2.49 each, to $9.99 each, plus shipping. Most of them are below the $5 price point. One seller had 8, and another had 5, and there are a few more with several up up for sale. If anyone is interested in purchasing this figure from me, send me a PM. They will be $2.50 plus shipping. I'll try to find the cheapest shipping as there is a UPS, USPS Post Office, and FedEx all near my house. "If anyone is interested in purchasing this figure from me, send me a PM. They will be $2.50 plus shipping. I'll try to find the cheapest shipping as there is a UPS, USPS Post Office, and FedEx all near my house. " The figure used for this unit is Artus Cimber from the WizKids, Tomb of Annihilation set. 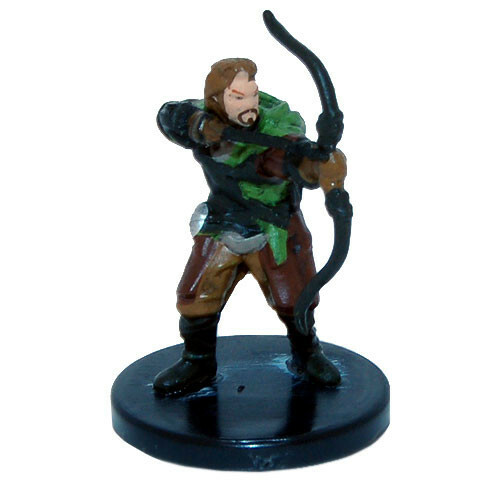 The figure used for this unit is from the Pathfinder: Rusty Dragon Inn set. 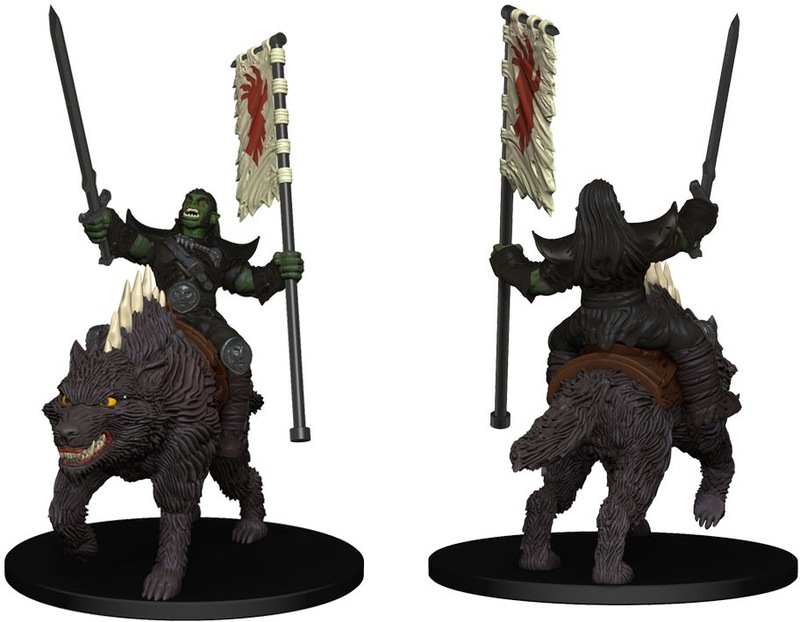 The name of the figures used is Orc Rider on Dire Wolf. The other person I was in contact with is sending me an additional 7, bringing my total from 46, to 53 figures. If I find more, I'll post about it here. Assuming about 3 - 4 per person, as that's generally what you want with an army of Deepwrym, once the packages arrive, I will personally have enough for about 14 people. Yes that was the idea. I'll try to get what I can from means outside of the usual online stores that everyone generally uses.